People generally stay in hotels temporarily when they need some place to stay over-night or for a few nights other than their house. Typically, hotels are designed for people that are on vacation or simply out of town. Since some vacations may last longer than usual, leaving your cat at home is not recommended. But when you are unable to find someone to take care of your cat while you’re away from home, the only other option is to take your cat with you on vacation. Finding a hotel that allows pets is difficult. But when you do find one, you may notice that your cat isn’t very happy about the change of locations. This may result in them meowing and whining all night, which then leads to you disrupting the people around you. Here is some advice that may help solve the situation. It may seem obvious, but many people skip over this step. Before you do anything else to try and quiet down your cat, you will need to find out what exactly is causing your cat to meow. For instance, they may be too hot or too cold in the hotel room. They are used to being comfortable with the environment and temperature of your home, and now they are in an entirely new place where the things around them and the temperature is different. Another reason that your cat may be meowing is that they are hungry or thirsty. So make sure that your cat has enough food and water laid out for them. Being that you’re in a hotel room, you are advised to bring a mat to place the food bowl and water bowl down on the floor so that your cat doesn’t make a mess on the hotel’s floor. You may also find it helpful to bring treats for your cat to keep them extra happy throughout your stay. Another popular reason for your cat meowing during your stat in a hotel room may be that you aren’t giving them enough attention. Typically when people are in hotel rooms, and especially when they first arrive, they are busy unpacking and getting settled in the room. This could potentially result in the cat not receiving enough attention from you. Since the hotel room is a brand new environment for your cat, you could be the only familiar thing to them at the moment. So be sure to give your cat enough attention, if that’s the source of their meowing. While packing for your visit outside of town, it can be difficult to remember to bring everything that you personally need for your trip. Not only this, but it can be even more difficult to try and remember everything to pack for your cat as well. 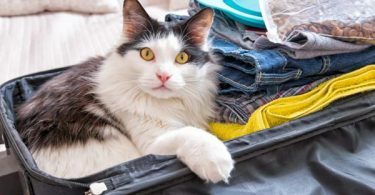 Because of this, you’re advised to make a packing list for the things that your cat needs on the trip in order to successfully plan ahead before traveling. For instance, don’t forget to bring their litter box. According to Caroline Golon, if your cat had a difficult time when first training to use the litter box in your house, then you may have a difficult time trying to get your cat to use a portable one or a different one in the hotel room. But you may find it beneficial to bring an additional litter box just so that they have multiple options. Secondly, you’ll want to make sure your cat is cleared to travel. According to All Feline Hospital, making an appointment with your veterinarian before your trip is recommended because it allows you to make sure your cat is healthy enough to travel. This will not only reduce the potential for your cat to be put in harmful situations that may cause too much stress on them, but it will also reduce the amount of anxiety you will have while traveling and wondering whether there is something physically wrong with your pet. Lastly, aside from the cat food and treats as previously mentioned, Carrie Pack advises being sure to bring some of your cat’s favorite toys on the trip with you. Being that they’re going to be in an entirely new environment, it’s important that you make the environment as familiar as possible by surrounding your cat with their favorite toys and cat bed. Your cat is used to your home where there are cat toys, comfy couches or chairs, and other familiar things that they love and are used to being around all the time. Because of this, you can possibly prevent your cat from meowing constantly by making your hotel room a more cat-friendly environment before letting them out of their crate for the first time. For instance, before letting the cat roam around the hotel room, Shane Ryan recommends that you make sure the windows are shut all the way and be sure to remove any furniture that your cat may use as a scratch post or other potential objects susceptible of gaining your cat’s attention. Inspect the entire room and ensure that there are no potential hazards for your cat. In addition to this, you’re also advised to have some type of sign for your hotel room door to inform people on the outside that there is a pet in the room. Sometimes hotels that are pet-friendly have tags that you can hang on the door, so be sure to ask for the sign. In order to make the hotel room more cat-friendly, you’re also advised to bring a blanket or air freshener that you have from home in order to make the hotel room smell more like home. Do not bring a candle because that poses a fire hazard and is likely against the hotel’s regulations, but maybe find a similar scent to the candle in the form of a spray air freshener. Another way to make the hotel room more cat-friendly is to choose a hotel room that is a suite and contains a separate bedroom, a kitchen area, and a bathroom. This is beneficial because hotel suites usually have a tile or hardwood floor in the kitchen area, which makes it the best location to place their cat food bowl and water bowl. Not only this but having a suite is also beneficial because there are multiple rooms for your cat to explore and keep themselves busy in. Since the hotel suite has multiple rooms, this allows you to keep your cat secured in one room while the hotel staff cleans the other rooms. Generally, hotel staff is not permitted to clean a hotel room if a pet is lost and roaming around, so keeping them in a separate room allows the hotel staff to successfully clean up for you. Furthermore, you’re advised not to put your cat in the hotel bathroom unattended for long periods of time. There is a shower curtain, toilet paper rolls, and towels that they are usually attracted to playing with. Cats can ruin them, resulting in you paying for the damaged property of the hotel. Not only this, but leaving them in there for long periods of time can result in them stressing about being left alone, so they may scratch the door and cause additional damage while you’re gone. 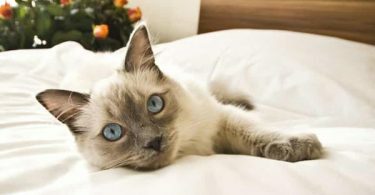 If you’ve prepared the hotel room to be cat-friendly and you’ve done everything you can to ensure that your cat is comfortable while in the new location, there are still some general ways to get your cat to quiet down and get comfortable in the hotel. This prevents the possibility of your cat worrying about them not getting fed enough. If they know that they’re getting fed at certain times, they’ll get used to it and expect it. This then leads to them having less anxiety about not knowing when they will be able to eat next. Since you may not always be around the hotel at the same times throughout the day, it may be beneficial to purchase an automatic feeder that releases food on a timed schedule that you can set. 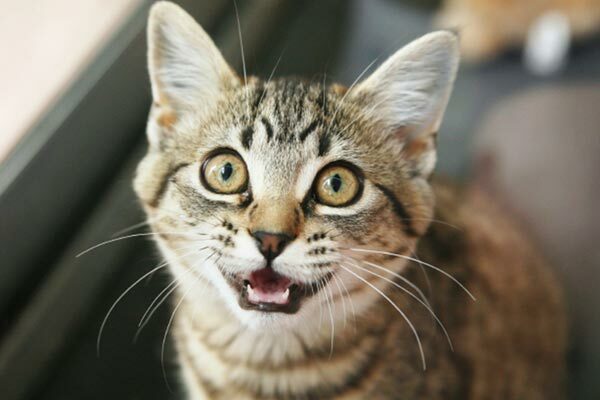 While it may seem plausible to punish your cat when it meows to get them to be quiet, like shouting at them, hitting them, or throwing things at them, it is not recommended. Not only will they eventually be fearful of you, but this tactic makes your cat not feel comfortable around you and doesn’t usually help in making them quiet. In addition to this, the result of punishing your cat for meowing will lead to them being scared to meow at all. This could be problematic because when something is physically wrong with them, they’ll refrain from meowing since they will be scared of you. The majority of the time, cats are meowing because they at least want some form of attention from you. Consequently giving them attention will help. According to Adrienne Kruzer, you can give your cat more attention by letting lay in the bed with you and cuddle with you because it allows them to feel comforted. Simply letting your cat know that you are paying attention to them in any way can be enough to make them stop meowing. Not only do cats sometimes want your attention, but they also want you to play with them. Because of this, play with their cat toys with them. Doing so will tire them out since they’re using their energy. After playing and running around for a while, your cat will eventually lose interest and become tired, resulting in them resting satisfied. Aside from stopping your cat from meowing when you arrive the hotel, there are other things you can do to prepare your cat for being in a new environment as well as when you are traveling with them. 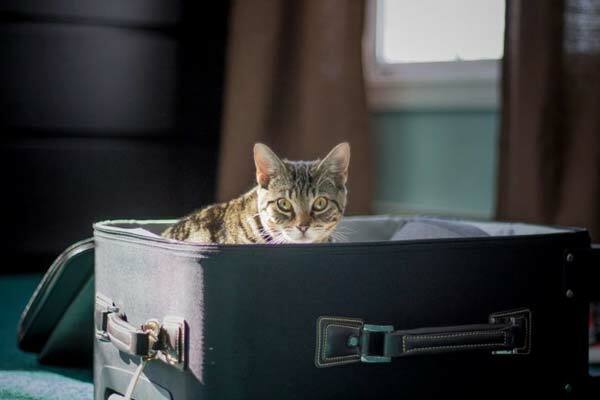 If you search for a travel carrier that your cat is actually comfortable in, this could benefit not only your travels, but it may also benefit you when you’re at the hotel. You can make sure you find the right cat carrier for your pet by taking them to the store with you and letting them try out the different carriers. Pet stores usually allow pets inside the store, so you shouldn’t have a problem with taking them shopping with you. Additionally, this YouTube video can help you better understand how to find the best travel carrier for your pet. Removing your cat from the only place that it has known all of a sudden can cause your cat to be distressed. Because of this, you’re advised to expose your cat to new environments regularly before you travel with them. By exposing them to new atmospheres constantly, you’re preparing them to get used to being in new places, resulting in them worrying and stressing less when they arrive in the new hotel environment. This may seem obvious, but it is possible for you to lose your cat while traveling. And if you haven’t lost them while traveling, there’s still a possibility of losing them while at the hotel. Because of this, you’re advised to put a collar around your pet’s neck with your name and contact information on them before leaving your house. Overall, traveling with your cat may not seem like the best choice because not many people choose to do so. But it’s convenient for people that want to bring their cat on vacation or on a trip in general with them. Since not many people choose to bring their cat with them while traveling, there isn’t much-known information or advice on bringing your cat to a hotel. Not only this, but you can seem hopeless when your cat is in the hotel room with you and meowing constantly. You’ll first need to identify the cause of their distress and continuous meowing. Then, you’ll need to find ways to make your cat more comfortable while in the hotel room. It’s a new environment and they’re simply not used to it yet. Overall, just remember to have fun and enjoy the time away from home with your pet.